Does eating certain foods make you sick? Obviously foods that are spoiled or have bacteria from sitting unrefrigerated too long can make you ill. However, what about foods that taste good and seem to be ok to eat? Like table salt, fast food and so forth. Recently I had a dear friend find out that his high blood pressure was preventing him from obtaining a lucrative government job. So we went on a grocery shopping mission to find foods he could eat that were healthier and less salty than the packaged and processed foods he accustomed to eating. It truly amazes me how small portions of frozen dinners often contain more fat, salt and calories than a huge pile of steamed veggies and meat! 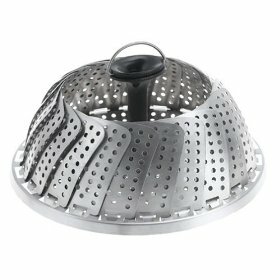 One of the simplest healthy eating devices I introduced my friend to was the vegetable steamer. Yes, the metal steamer that you can insert in a pot with a little water and steam your veggies for dinner or lunch. Steaming is one of the best ways to cook vegetables. It leaves more of the vegetable’s natural taste, color and nutrients intact than any other method, and it requires no added fat. If you buy fresh produce like broccoli, and steam it instead of eating a tv dinner, you cut out a whole lot of unnecessary salt added to improve the taste of basically old frozen meat and veggies. You also cut out a lot of fat and other chemicals used to preserve the food and add flavor to what really is an unappetizing dish! You can buy a stainless steel veggie steamer from most stores including Target, Kmart, Bed Bath & Beyond or Amazon. The Trudeau Steamer runs about $17.00 at Amazon right now. Link here. Read more on “How to Use a Veggie Steamer” here. Watch a video on how to steam veggies here.